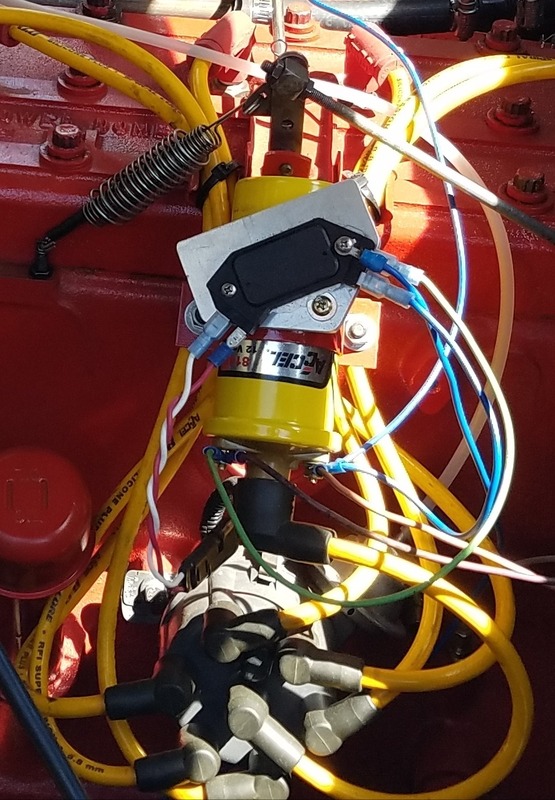 Where can I buy an HEI ignition for my 308 Hornet engine? Pertronix, summit racing sells the units. You can call pertronix and get the part number you need. I made one like Fig.3. Worked really well. How about 6 volt + ground? I thought I saw a complete HEI GM distributor modified to fit 308 engine. Am I dreaming? If so, might anyone out there be familiar with who makes this ,modification. Not sure about the 6-cylinder HEI but a distributor from a Chrysler slant six just about drops in. You replace the inner shaft of the Chrysler unit with the Hudson inner shaft and trim a fee thou off the distributor body to fit the 308 distributor bore. You can then trigger a HEI module with the trigger in the Chrysler unit or run a straight Chrysler electronic ignition. I’m running HEI Distributor in my 46 straight 8 Hudson Pickup. It came from Charlie Harris, running 12 volts. With today's technology and miniaturization there is really little need to resort to trying to modify the old HEI distributors. The Pertronix is simple, easy and relatively cheap to buy and install. Yes for the tinkerers the HEI and Mopar mods might be fun, but in the end just go with the most modern solution. The fact that Pertronix actually makes these for Hudsons (6V pos ground, plus 12V neg ground for those that have made the conversion) is somewhat amazing! I have a pertronix conversion in my 51 Commodore 8 6volt positive ground that works great. The distributor is difficult to get at in the car because it’s very low at the rear. I removed the inner fender and used the recommended coil from Pertronix. You also have to replace the coil and plug wires with suppression type wires. Solid copper wires can not be used. The Chevy 6 HEI Distributor fits Hudson Block but needs an adapter to extend the Hudson shaft. Ive installed Crane XR700 Point Eliminator Kits in my distributors but they are 12V. I did the same with my 49 8cyl. Looks stock but has very hot spark. It is great they have these available now for the 8. Back in 2005 when i was getting my '50 on the road they offered to do a one off for $350, I said no and rebuilt mine. So another amazing help for the Hudson engines. I wonder sometimes how many 8s are still on the road? You can buy Black original looking 7mm suppression wires from speedway. They have them listed in the flat head Ford section.